9 Vibration modes by CalExotics. Its shape a crowd-pleaser from day one, the Panther features a twist on a traditional rabbit, complete with smoothly swollen shaft and tickly panther stimulator. Tapered at the tip and textured down a straight penetrator, the Thrusting Panther offers up a namesake thrust function as well as rotating beads just below the tip. At the touch of a button, the beads activate, spinning as the shaft pumps up and down in nine intensity patterns. Below the shaft, a full-coverage panther shaped tickler adds nine separate vibration modes to the mix, combining steady pulses with roller-coaster escalation. 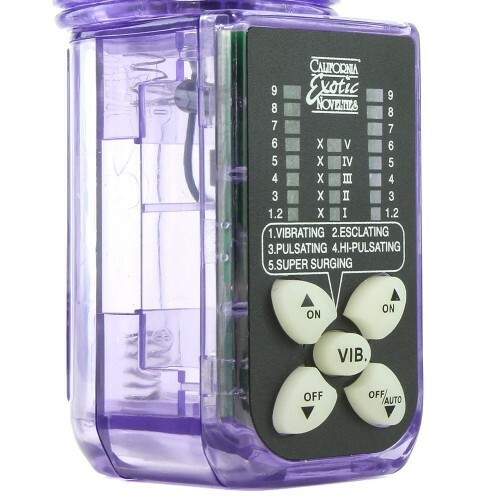 Separate buttons control each function, making for easy and quick adjustment. In body safe TPR plus sturdy ABS plastic, the Thrusting Panther cleans easily and thoroughly using warm soapy water or a good toy care fluid/foam. Compatible with water and silicone based lubricants. Requires 4 AAA batteries (sold separately). Not recommended for use in water.